With our top of the line equipment and experienced staff, we make your trip as smooth sailing as possible! It’s simple: after getting secured in a lifejacket and harness, flyers make their way to the back deck of the boat. Once the flyers are secured to the parasail, they are instructed to sit down on the back deck for take-off and then they are ready to fly! The flight is approximately 10-12 minutes long. After enjoying the views, flyers descend back to the deck of the boat for landing. Landing is as simple as standing up! And that’s all there is too it! *Ages 6 and up. Special accommodations can be made for anyone with particular circumstances: Be sure to inform your captain and mate of any special accommodations before the trip departs. Parasailing is a lifetime memory! Parasailing the waters of the Crystal Coast :: Where every seat is a window seat! Check out our Facebook and Instagram to see a glimpse of the incredible views that you’ll experience while flying hundreds of feet above the Crystal Coast. Safety is our #1 priority! We take pride in putting the safety and comfort of our customers first! 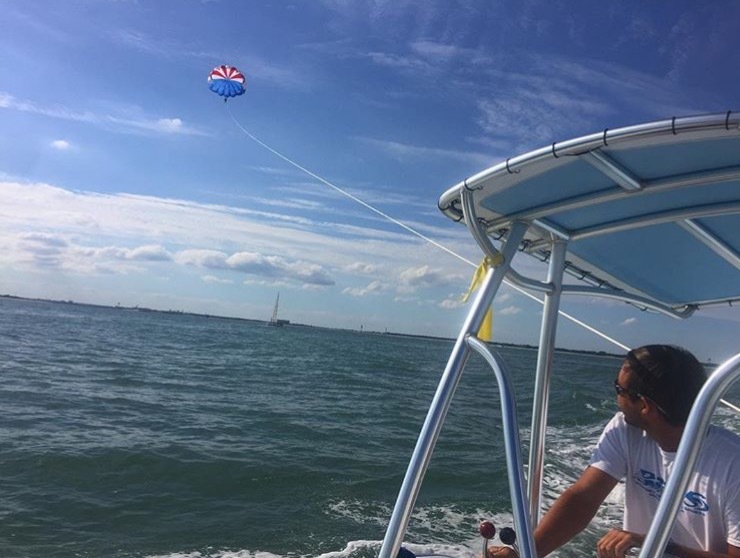 With a licensed captain and trained instructors, we ensure that you’ll have a fun and safe parasailing experience.